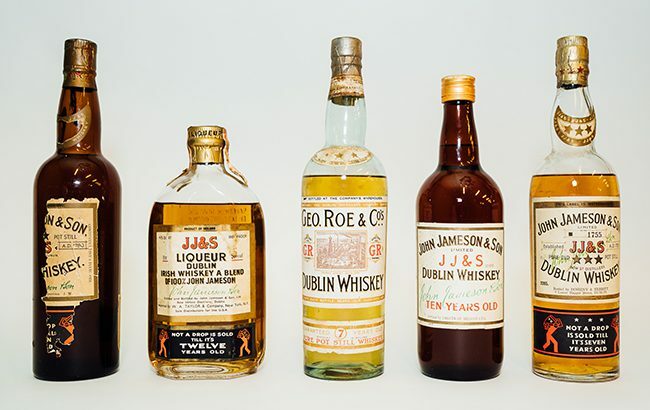 A rare bottle of George Roe Irish whiskey from the 1890s will go under the hammer at auction next month and is expected to sell for between €6,000 and €12,000 (US$6,785-US$13,561). The bottle will be go on sale on 8-9 May at the Irish Connections Collectors sale, held by family-owned auctioneer Victor Mee Auctions. The George Roe Irish whiskey is thought to be one of the rarest bottles of Irish whiskey on the market. The bottle was provided by former pub owner Des McCabe, who inherited a rare collection of Irish whiskey from his aunt. “The bottle itself is in excellent condition with some evaporation and depicts the Thomas Street Distillery,” said Bryan Mee at Victor Mee Auctions. George Roe Whiskey had its beginnings in 1757 when Peter Roe bought a small distillery in Thomas Street, Dublin. In 1889, George Roe & Co Distillers joined William Jameson & Co and the Dublin Whiskey Distillery to form a trading unit, called the Dublin Distilling Company. George Roe & Co Distillers along with its two partners ceased to produce whiskey in 1926, with large quantities of unsold stock left over. In the mid-1940s, the company was closed and Guinness took over the site of the Roe Thomas Street distillery. Bidders as far afield as Hong Kong and the US have registered their interest in the sale. In addition to the George Roe whiskey, the sale will also include a rare 1940s JJ&S Liqueur Dublin Irish Whiskey, a blend of 100% John Jameson whiskey, distilled and bottled by John Jameson & Son. The bottle is expected to earn between €800 to €1200 (US$904-US$1,357). High interest is also expected for two bottles of 1950s John Jameson Whiskey, estimated to fetch between €400 and €600 (US$452-US$678).